Did saw the drop coming on the FKLI, just not as furious as seen this morning. Missed a post yesterday, so all is just on hindsight. 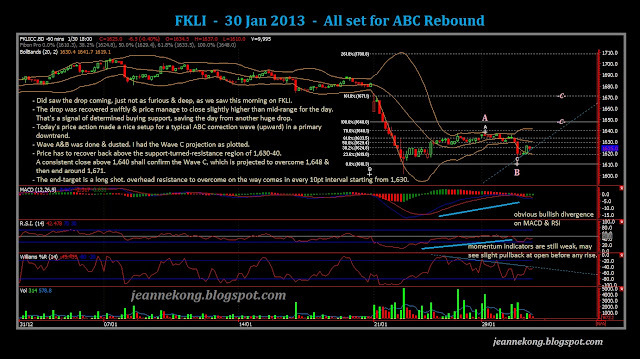 However, the price development today on FKLI did shed some lights on its whereabouts & its gonna-be in near future. Previous recovery from the 2-day plunge low of 1,601.5, all the way slowly up to 1,639 high, that formed the first part of a rebound, Wave A.
Pivoting at 1,639, price then consolidate with a slight downward bias, before the eventual drop seen today to low of 1,610, that shall be Wave B. The subsequent swift recovery, back above & closed at 1,625, will mark the start of Wave C.
A fibo projection on Wave A-B, gives a Wave C target of at least 1,648, possibly 1,671. Of course, that's quite a long shot from the close of 1,625 today. On the way, price might see some obstacle at 1,630-40, previous support area, turned resistance. Further up, some hindrance will come in at every 10pt intervals, namely, at fibo level of 1,648 | 1,660 | 1,670 levels. Momentum indicators are still rather weak, hence we may see some pullback tomorrow before any rise. Do note that we are in for another 3-day weekend, which may dampen tomorrow's trading activity. 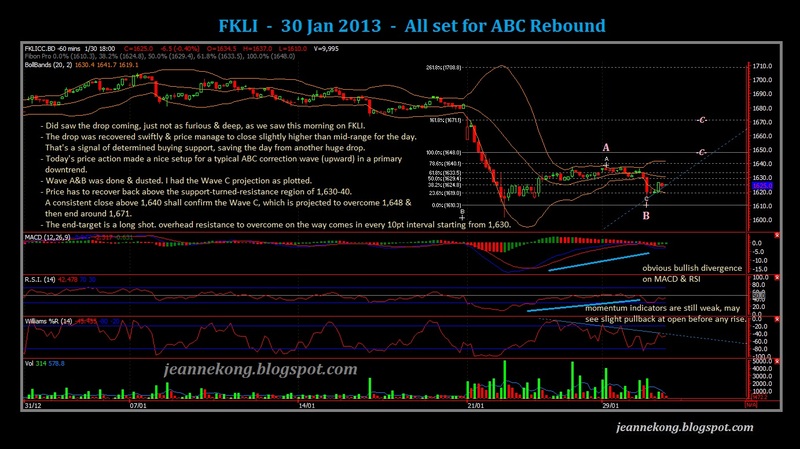 Caution also on the lurking election uncertainties which may well resurface after the bustling-with-noise CNY 2013. 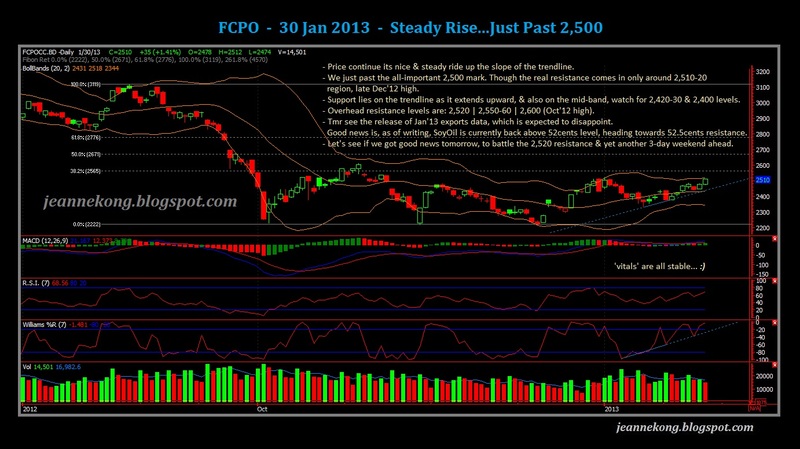 FCPO continue to rise steadily along the slope of an uptrend line. 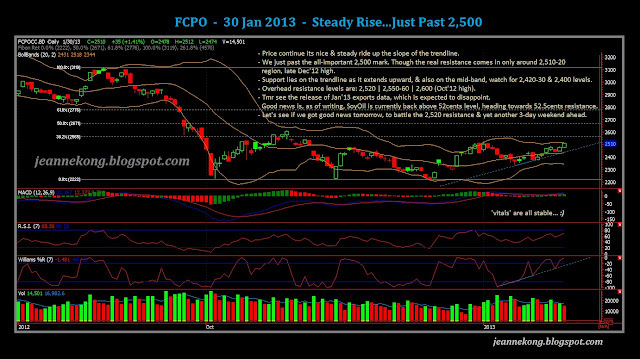 Just past the 2,500 mark today, while manage to close above it at 2,510, near day high. Momentum indicators are all stable & healthily bullish, volume is slightly below average, though. The imminent resistance at 2,510-20 area (Dec'12 high) overhead shall requires more participation if it's to be overcame. However, given that tomorrow may see light trading ahead of Jan'13 export data release, & also the coming 3-day weekend. Anyway, if 2,510-20 level is pushed through, next resistance shall be at 2,550-60 levels, followed by the psychological level of 2,600 (Oct'12 high). Support remains on the daily mid-band & the trendline as it extends further up. 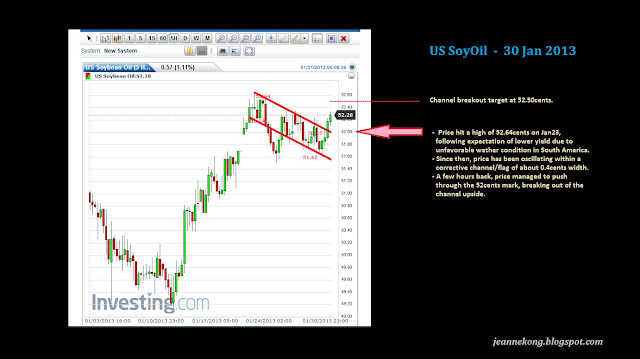 As of writing, SoyOil broke out of its correction channel at 52cents mark, currently trading at 52.3cents. Breakout target is at 52.50cents, which is also an important & persistent resistance to SoyOil price movement. Note that at 1415EST (US eastern time), Fed FOMC committee meeting will close with a media announcement by Chairman, Bernanke. Previous rife on a potential early end to QE3 on improved employment & economic data, may be announced during this media conference. However, a surprising drop on 4Q12 US GDP to -0.1% from previous quarterly reading of 3.1% may well push the pause button on the winding down of QE3. Anyway, I'm not going to wait till Bernanke deliver his speech. We will have the conclusion on the headline tomorrow, while overnight performance on DJI shall tell a lot on Wall Street's reaction towards the FOMC decision.